Google has launched an API for Google Analytics. From what I’ve seen so far, it’s a fairly large XML API (with OAuth and basic HTTP authentication support) that allows you to programmatically gain read-only access to virtually any data that the main Google Analytics site can display. The API will allow developers to extend Google Analytics in new and creative ways that benefit developers, organizations and end users. Large organizations and agencies now have a standardized platform for integrating Analytics data with their own business data. Developers can integrate Google Analytics into their existing products and create standalone applications that they sell. Users could see snapshots of their Analytics data in developer created dashboards and gadgets. It looks a bit technical, and I haven’t had a lot of time to look at it yet, but you can read all of the documentation over at the Google Code page. There are no hard API limits, like with the Twitter API, but Google reserves the right to block requests if they are excessive, as is typical. 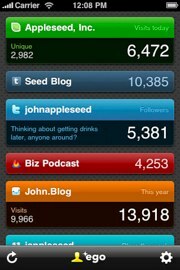 Hopefully we will be seeing some new desktop/iPhone/etc applications for keeping up with our statistics. Google Analytics is one of the most popular, and most comprehensive, web statistics services. It’s not the most user-friendly site in the world though.� I’ve spent plenty of time digging around in its interface, and I’ve found a killer feature that should really be highlighted a bit more. By using the Segment dropdown, you can pull-up pretty much any data you could ever want about the page. Which sites are referring all those visitors? Just choose the “Source” option from the menu. What browser do they use? The Segment dropdown saves the day again. You’d be surprised how many people don’t know this option exists. It’s, in my opinion, one of Google Analytics’ most useful features.